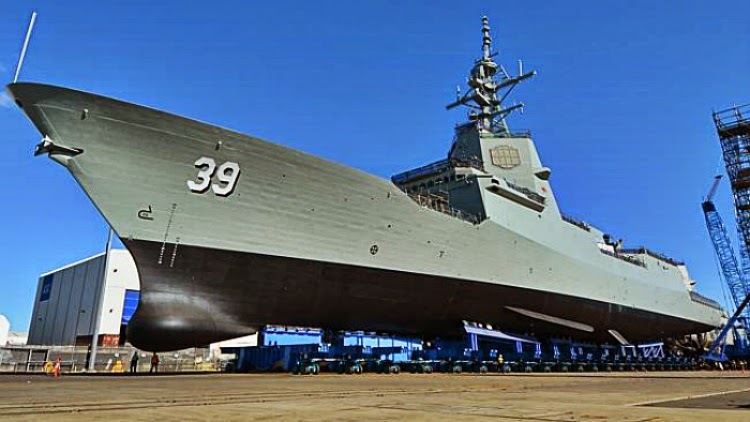 CANBERRA, -- AUSTRALIA’S most powerful warship will launch on Saturday — the first product of the $8 billion Adelaide-based air warfare destroyer program. The three Hobart Class ships are the nation’s most complex and largest defence project. The first is already bristling with highly complex electronic warfare and radar systems. Most significant is the Aegis system, a high-powered radar that can search, track and guide missiles simultaneously. It can track more than 100 targets at a range of more than 250 nautical miles. Stepping aboard the 146.7m-long ship at ASC’s Osborne shipyard, where almost 1500 people are working on the Hobart Class construction, the project’s scale becomes apparent. Banks of computer screens are covered up for secrecy in the cavernous Combat Information Centre, a networked war room which controls missile launches, torpedos and other weapons systems. Highly skilled workers, lead by Ship One manager Steve Marsh and test and activation director Paul Normandale, until this week accessed the ship from a multistory tower which includes storage, offices and other facilities. Excitement is building across the shipyard because the launch will signal a break from criticism of project delays of at least 30 months and a budget blowout of at least $600 million. These have been variously blamed on problems interpreting the ship’s Spanish design and other “first-of-class” issues. “The guys are quite excited (about the launch). You can definitely feel the atmosphere. They’ve never seen a ship like this. They’ve got a lot of pride,” Mr Marsh said. “They’ve come to ASC as a place of choice. Mitsubishi guys came here. Others came here in the middle of the mining boom — they’re really invested in what we’ve done. The destroyer this week was moved on giant hydraulic rollers to prepare for the launch, which involves lowering the 7000-tonne ship on a synchrolift — a giant platform which on Saturday will lower it into the water. This is a common user facility owned by the State Government. The Hobart is 76 per cent complete, three years after the first steel was cut for the ship. The Mk45 five-inch gun was installed less than a fortnight ago. After Saturday’s launch, the ship will be moored alongside an ASC dock, where Mr Normandale will lead testing of propulsion and combat systems ahead of sea trials starting in12-18 months in Gulf St Vincent and elsewhere. The Hobart is scheduled to be handed over to the Navy in March, 2019, while delivery times for the other two ships, Brisbane and Sydney, are yet to be finalised. The Royal Australian Navy Air Warfare Destroyer Hobart moved ahead of launch.